I’ve rather a lot of things to do today, so there’s no time for a proper blog entry. 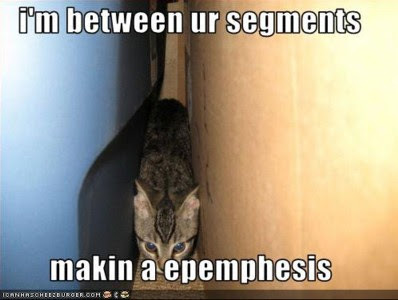 Instead I offer you a lolcat. It’s rather literate for a lolcat, knowing about correct apostrophes in pronoun-verb contractions and having heard of epenthesis eˈpentθəsɪs. The spellchecker is a good way of finding those words that you think you don't have problems with, but do. It's surprising that so many people are ready to condemn spelling mistakes - are they such good spellers themselves that they have no reason to fear a mistake of their own lurking around the next corner which will leave them with egg on their faces? The spellchecker has taught me a couple of things, but it doesn't help when I type 'form' for 'from'. Which I suppose is what the video was all about. Paul, I agree. If people rely on their own spelling rather than a spell checker, then ultimately the proof of the pudding will be in the eating. That is to say, their output will be judged on its meringues, and whatever comestibles do pass will be just desserts, which may indeed leave egg in their faeces. @Alan - did you type all that without a spellchecker? Seriously, though, I rarely use a spell checker. I find that given half-way decent spelling (and half-way accurate typing), the additional effort and potential harm far outweigh the benefits. That's not to say that I won't make the occasional mistake without one, but unless a spell checker is used slowly and carefully it risks turning what would otherwise be a minor typo (or sometimes no error at all) into a howler. In any case, far and away the most common form of error in what I write is not spelling mistakes but garbled grammar resulting from careless editing. I find it really quite easy to type an initially grammatical sentence but then to redact it into gibberish. (Maybe if I thought more in advance about what I was going to write, I'd need to do less subsequent editing, so it wouldn't happen as often.) Even so, I would very seldom use a grammar checker, as they are even worse than spell checkers; the only way to catch these sort of errors is proper proofreading. The Ancient Etruscans never used to worry about spellcheck. They simply spelled phonetically and that was that. One scribe might spell a word one way and another scribe another but somehow it all remained legible. Go figure. But still, I use spellcheck in the modern world just in case I have eggz on my faeces. Lol. Oh my god, I'm a esl teacher and I adore your blog!